When we hear Gigabyte, we generally associate the name with Motherboards, Graphics cards and overclocking. 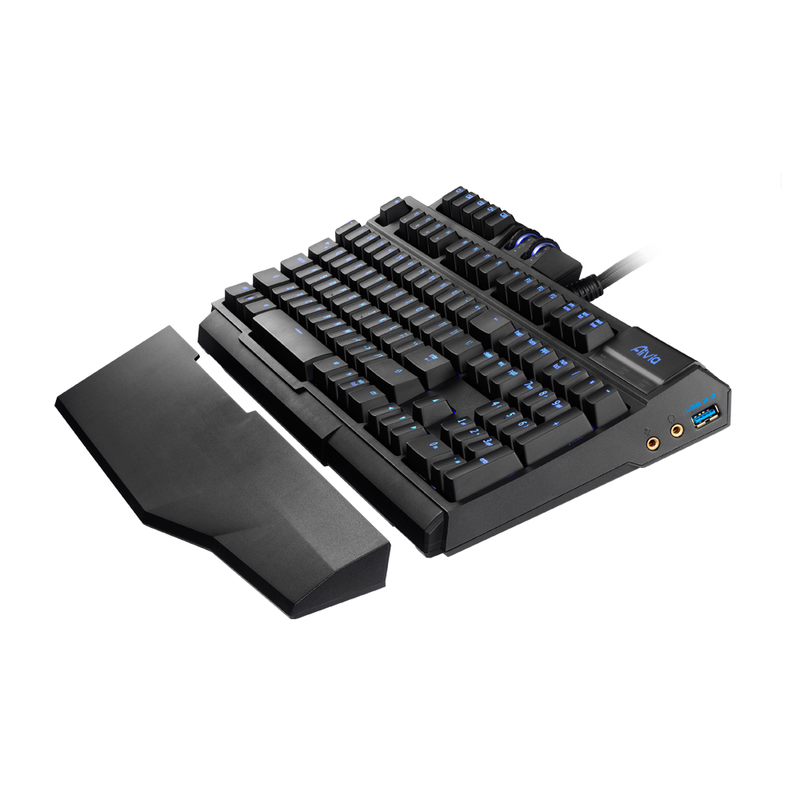 As we see many manufacturers saturating the peripherals market, I was really interested to see what Gigabyte had to offer in terms of a mechanical keyboard. This review is a follow on from the Force H3X gaming headset review as we work our way through a set of gaming peripherals that Gigabyte made available to us for testing. 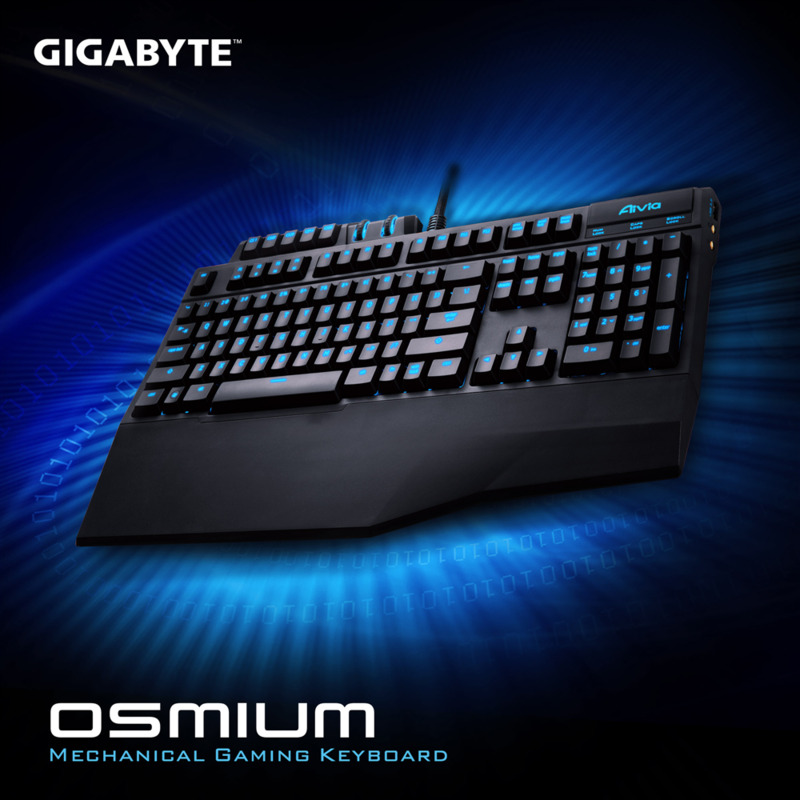 With their market presence, team sponsorship and access to gaming professionals, it should have come as no surprise when Gigabyte designed, produced and marketed the Osmium. They are in an optimal position for market analysis and self-awareness. 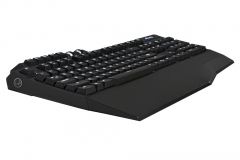 The Osmium is a backlit mechanical keyboard that is available to the masses at a price most should be able to afford. Osmium – it’s a weird name. Wikipedia tells me that it’s the densest naturally occurring element with symbol ‘Os’ and atomic number 76 and that the name comes from the Greek word ‘osme’ that means smell. 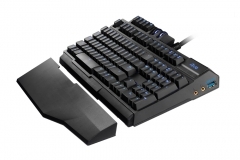 Although that’s interesting trivia, the Gigabyte Osmium mechanical Keyboard is also an interesting product that deserves a little attention. 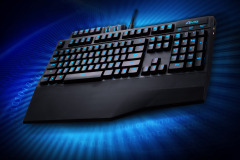 Gigabyte has used the Cherry Red switches with 45g actuation force and no detectable switchover. 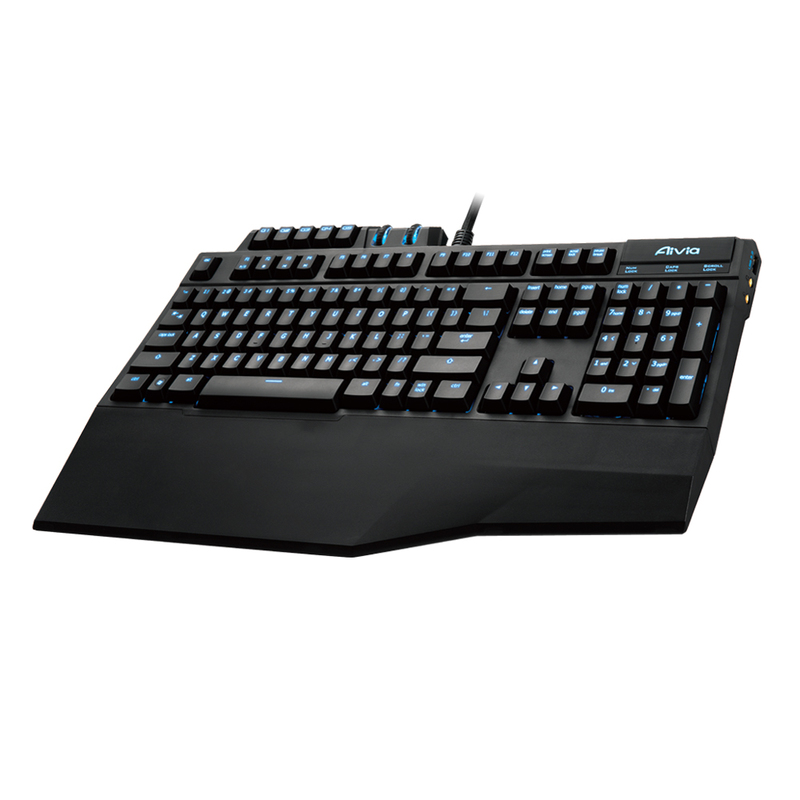 The keys have a blue backlight that can be dimmed or turned off via a scroll-type wheel near the macro keys along the top edge of the keyboard. Although the Osmium is listed as being available in Cherry Red and Cherry Brown switches, we haven’t seen the Cherry Brown available in Australia and our review sample was a Cherry Red. 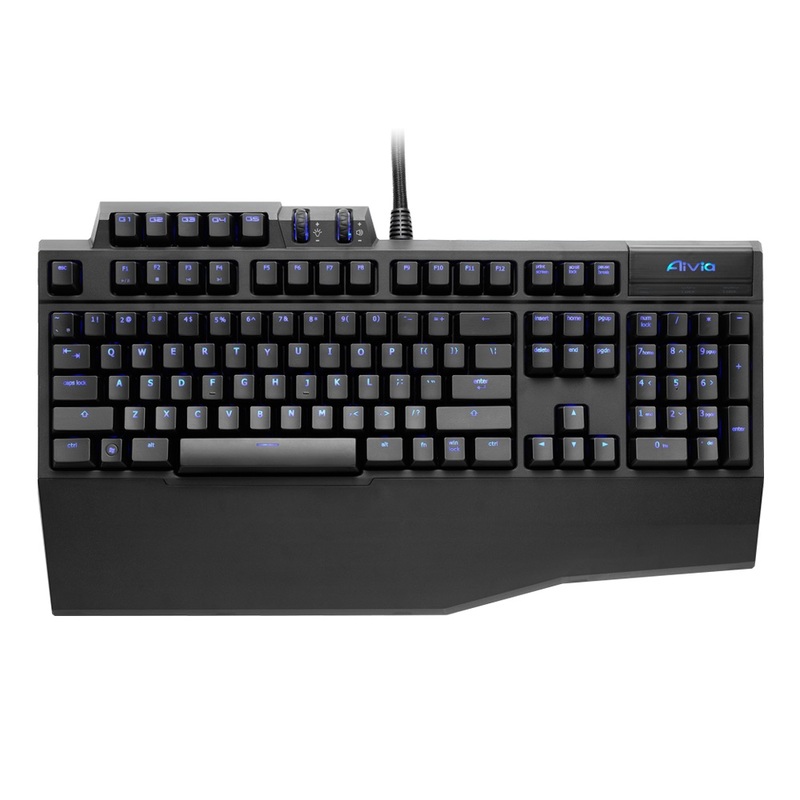 The main difference between Cherry MX Red and Brown is the detectable switchover/activation when you press the key – both switches have the same 45g actuation force. Gigabyte have rated the keys at 50 million key presses due to using superior materials and design. This is what we’d expect from any quality mechanical keyboard and in my testing of the review sample I had no reason to doubt the build quality. The Osmium weighs 1.5kg so it feels heavy and doesn’t move around on the desk unless you intend it to. The specification states that the Osmium supports 64 simultaneous key presses via USB. Our testing aligns with this but it was a real mission to actuate that many keys at once and impractical but it’s a vital feature for most serious gamers. Nobody likes it when you hit a key and the key-press doesn’t register. The GHOST Macro Engine allows you to select from 5 profiles to use the dedicated macro keys. The setup is via software and I found it easy enough to use. Sadly, the function is somewhat wasted on me as I very rarely use macro keys but in the basic testing I did, this worked as advertised. The specifications don’t include Windows XP/Vista and 7 but I didn’t have any issues with the software when using it with Windows 8.1. Audio and USB (2 and 3) pass-through with 18K gold plated connections and a braided cable to keep things neat. The cable is quite thick due to the amount of pass-through but it is neatly bound and easy to work with. Testing involved using the Osmium for a month instead of my normal keyboard. I didn’t have any issues after the first day in adjusting to the keys and my accuracy was no better or worse than ‘normal’ in general typing. 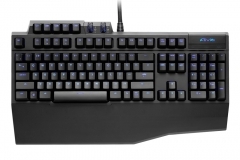 Personally, I prefer mechanical keyboards to the rubber domed alternative so I enjoyed the Cherry MX Red switches. 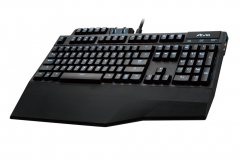 They do make more noise than the Logitech Romer-G keys but they still have that nice tactile experience for gaming. Extended periods of administrative work and gameplay were comfortable with the ergonomics suiting my wrists and arms. I used the rear feet in the upright position and appreciated the larger wrist rest. The wrist rest is removable for those that don’t like them but I can’t/won’t use a keyboard that doesn’t have a wrist rest so this was a winner for me. Gaming on the Osmium didn’t feel any different to other Cherry MX Red keyboards that I’ve used in the past at a tactile level which is to be expected. The keys are all standard in size, angle and the etching is clear. When gaming, I used the backlight on full and left it at that setting for both day and night. It’s a nice blue light that is even across the whole keyboard. I wasn’t expecting RGB for the price. USB data transfer is easier to measure and in my testing, the transfer rates via the Osmium were all consistent with the speed of the respecive USB ports with a direct connection. Audio was harder to quantify but try as I might, I couldn’t detect any difference in the audio quality from the ASUS Maximus VI GENE ALC1150 Supreme FX rear IO ports when using pass-through or direct to the motherboard. If there is any degradation in audio signal, I couldn’t hear it. The location of the audio and USB 3 port on the right side of the keyboard wasn’t an issue for me but it is worth noting for people who are cramped for space as it may encroach on the area where you wield your mouse. 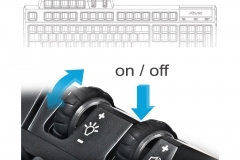 The flip-side to this is that the ports are really easy to locate and use compared to other keyboards where the ports are on the back edge of the unit. The Macro Profile keys are a nice inclusion and although we seldom use macros, for serious players this is often a ‘non-negotiable’. The implementation of this feature is welcome at this price point, increasing the ‘Bang for buck’ element of the Osmium. The build quality is good and the plastic finish doesn’t show finger prints much at all. After a month of punishment, there were no signs of visible wear. Although the cable is pretty thick, it is well braided and neat. There are a lot of cables in there too, USB 2.0, USB 3.0 and 2 audio cables for headphone and mic pass-through. Everything you need to keep that desktop a little neater. The packaging is what I’d expect from a premium offering and Gigabyte also included some extra key caps and key remover that you don’t see on other more expensive products. In terms of noise, the experience was typical of a mechanical keyboard with Cherry Red switches in that it was a little on the noisy side but no more than any other Cherry Red keyboard we’ve tested. Although I’d love to see an RGB version of this product but with a price of $129, I won’t hold the blue backlight against Gigabyte. It’s a nice blue with good key cap etching. 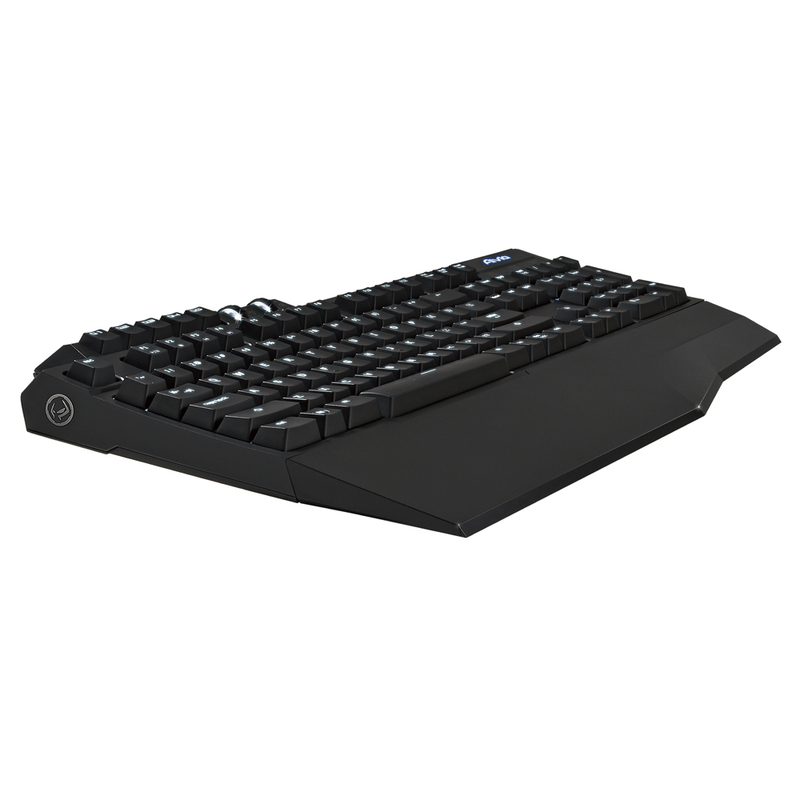 I’d be happy to use the Osmium as my go-to gaming keyboard and don’t have any complaints after using it for just over a month, solid. 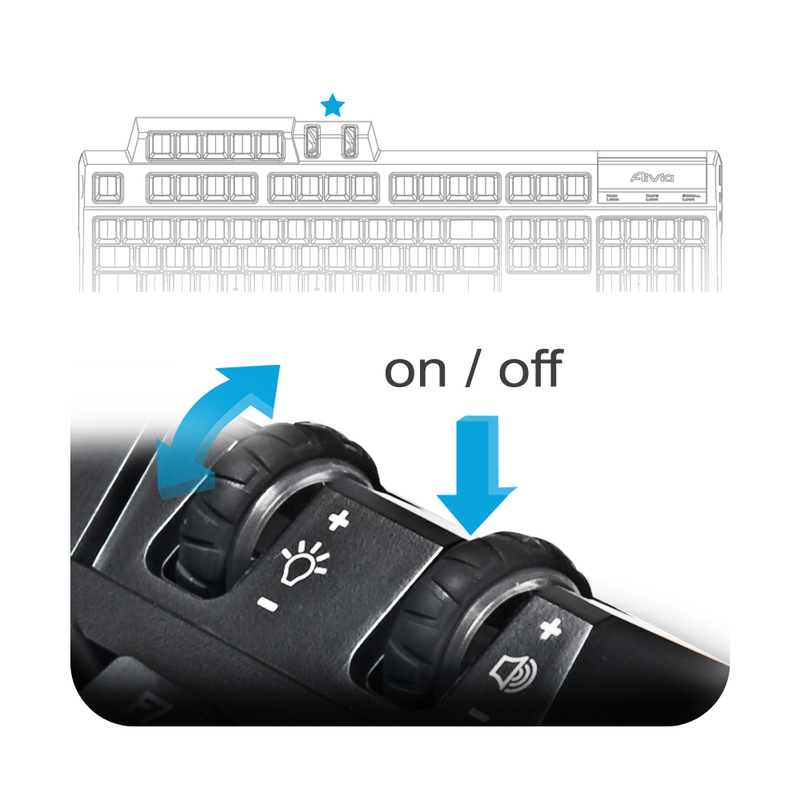 The desktop footprint isn’t too big, the volume control is easy to reach and the USB and audio ports are also very convenient to access. It does exactly what it says on the box, appears to have good build quality and comes in at a compelling price.